Calamagrostis acutiflora 'Karl Foerster' is an extremely reliable and highly recommended grass that forms attractive strongly upright clumps. The deep green lustrous foliage emerges early and lasts well into the winter. The feathery plumes have a purple tone when they first emerge and then, as the flower heads mature, they take on a golden tone and look like shafts of wheat. This grass is very versatile in the landscape where it can be used a single accent plant, grouped or mass planted. Because of its tolerance for wet sites it works well in moist low spots or along the edge of a pond. 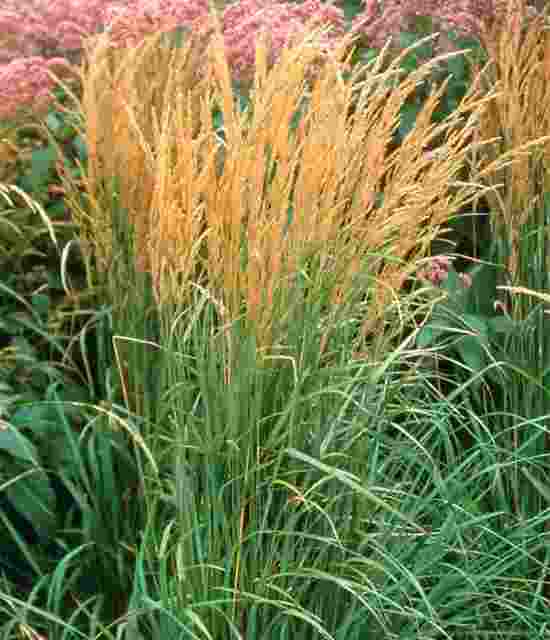 Calamagrostis 'Karl Foerster' was selected as the Perennial Plant of the Year 2001. Karl Foerster ' prefers a moist rich soil that does not dry out. It will tolerate clay and wetter sites. Cut it back early in the spring before new growth begins. Division can be done in the spring or late summer.